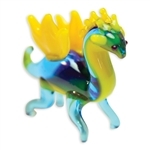 Fantasy - Looking Glass Online Shop - Highly detailed collectible hand-crafted glass sculptures of everything from Doggies to Dragons, Animals, bugs, Birds, Ocean Creatures and more! Draco the Dragon loves to sit around campfires and tell stories while roasting marshmallows and making s’mores. His passions include exploring mountain caves and the art of fire dancing. He is currently learning how to become a skillful fire dancer. Draco tends to be very competitive and hates to be outdone by his peers. His birthday is October 22, 2009. Drew the HappyDragon enjoys baseball, football, and anything outdoors. Drew has a little known talent of making extremely realistic shadow puppets. He’s very comical when he tries to fly with his tiny wings. Drew’s a gentle giant and prefers to find peaceful solutions rather than breathe fire to get his way. He was born December 2, 2009. Grady the Griffin likes to learn about mythology and is fascinated by these exciting tales. He is an extremely honest Griffin and values loyalty above all other traits. Grady loves word puzzles, riddles, and playing strategy games. Sometimes he will set up mind challenges for his friend Ashes the Phoenix who he always confides in. Grady was born January 8, 2009. Peggy the Pegasus loves cherry lollipops amongst other sweets and her favorite color is lilac. She likes to pass the time by laying in quiet meadows while gazing at the clouds. Fall is the most soothing time of the year for Peggy and she enjoys frolicking through the colorful hills. 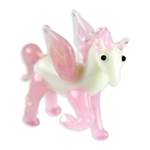 This sunny Pegasus always has a positive outlook on life and was born on May 26, 2009. Flame the FireDragon loves super spicy food and will eat jalapeños at every meal. Going to street celebrations and parades are his favorite activities and he is always thrilled at the sight of a stunning fireworks display. Flame dislikes cold weather and water and feels happiest during hot summer nights. He was born December 29, 2009. Brent the SeaSerpent has been around for hundreds of years. On a rare occasion, he is spotted by sailors crossing the sea. There have been sightings of Brent from all over the world as he’s made his way from the Atlantic to the Indian Ocean to the Black Sea. Brent likes to play tricks on humans and surprise them. He was born September 20, 2010. Eunice the Unicorn is often described as mysteriously beautiful. She is regal and selfless. Her horn is known to neutralize poisons and fight off evil. Eunice is free spirited, adventurous, and loves to try new things. Her most favorite pastime is reading books with her best friend, Grady the Griffin. Eunice was born September 14, 2010. 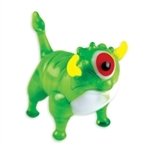 Blink the Cyclops is a fun-loving creature with an eye for detail. Blink likes to play hide and seek in the forest. He has a knack for finding the best hiding spots after all his years of hiding from humans. Even though Blink has never been seen by people, many stories have been written about his adventures. Blink was born June 29, 2011. Fantasia the Pegasus is a regal white horse with elegant wings. She is graceful and possesses a kind heart. Fantasia loves to soar above the clouds, feeling the breeze run through her feathers. She is a loyal friend and will even give airborne rides in exchange for some thimbleberries, her favorite treat. Fantasia was born July 16, 2011. Wilbur the WingedDragon loves nothing more than taking flight. His powerful wings are capable of carrying him over great distances. Sometimes Wilbur likes to play tag with his friends while soaring over steep, mountainous terrain. With his speed and agility, Wilbur rarely loses. Wilbur was born in a bejeweled cave on February 19, 2012.